← Candy Corn, Fresh and In-Season Now! 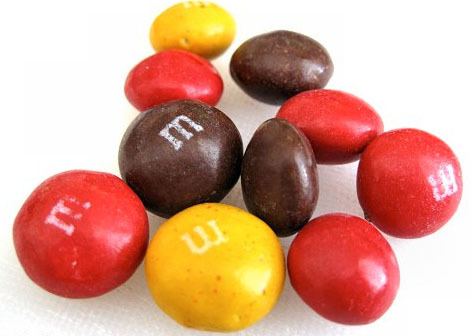 Which do you prefer: Reese’s Pieces or Peanut Butter M&M’s? I have been conducting taste tests with my friends on which peanut butter candy they prefer. Peanut butter lovers are a discerning crowd. Most have their favorite brands, and some prefer the all-natural, oil on the top stuff. Me, I’m not a fan of straight peanut butter, but I love, love, it with chocolate. One thing is for sure, both of these candies have a huge following. Not once did anyone tell me that they don’t like either brand. Let’s start with the Reese’s Pieces. Shown above, they are about the same size as original M&M’s. They are a satisfying snack, and it is easy to eat way too many at once. These became part of Americana with the movie E.T, and who wouldn’t love a candy-eating alien? In every taste test, M&M’s win by a landslide. I think this is because of 2 things. 1-the M&M’s have chocolate and 2- they are creamier and a little bigger. Reese’s pieces make better additions to cookies because of their smaller size. Here’s a good recipe. The colors are perfect for fall, so go ahead a whip up a batch, and mail some to me. So what we learn from this taste test is that when the remake of E.T. comes along, and we all know it will, he should eat peanut butter M&M’s.